I LOVE garlic scape pesto, just seeing those words printed makes me excited for summer to come! 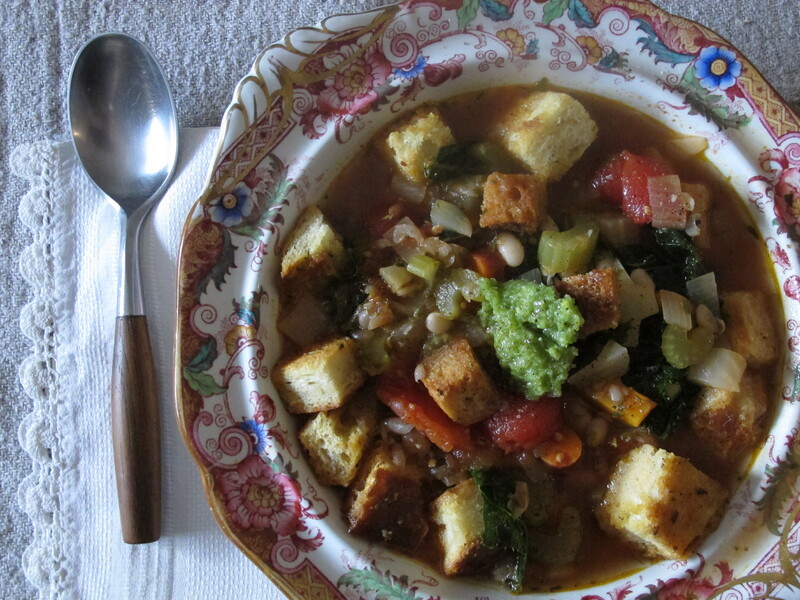 I was talking about panade the other day, but this is another delicious-looking option for a vegan bread soup! Thank you. I always love your recipes and photos. What a wonderful message to wake up to on this Wednesday morning in March! Thank you so much. The video, the Ribollita, the garlic scape pesto, it’s all love 🙂 You’ve made my day. Thanks for the fabulous feedback. Great video–yumm–makes me want to start cooking it NOW! Also love the song, who’s it by? Thanks!The song is by Dead Prez and it’s called Be Healthy. Joshua found it for me. I think it’s hilarious and I’m so glad he a) found it and b) passed it along. Looking for songs for the next video so if you have any suggestions, let me know!